The semifinals of the 2015-2016 PBA Philippine Cup heated up tonight with the San Miguel Beermen’s improbable comeback win from as many as 22 points down in the first half. 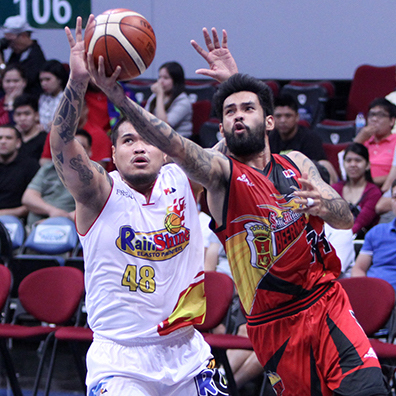 SMB rode the hot hands of Ronald Tubid and Chris Ross in a searing fourth quarter rally that caught the Rain or Shine Elasto-Painters with their pants down. Ronald Tubid came up huge for SMB in Game 1. The San Miguel Beermen shocked semifinal opponent Rain or Shine after coming back from a 20-point fourth quarter deficit to draw first blood, 109-105, in their SMART BRO PBA Philippine Cup best-of-seven playoff series on Tuesday at the Mall of Asia Arena. San Miguel outscored Rain or Shine 38-14 in a one-sided fourth quarter to come away with a surprising victory in a game in which they trailed by as many as 22 points. Back-to-back PBA MVP June Mar Fajardo led the way for the Beermen, finishing with a monster line of 36 points, 18 rebounds, and 5 blocks. Arwind Santos also had a huge double-double with 19 points and 17 boards, while Ronald Tubid finished with 15 markers, 11 of those in the fourth quarter including two huge three-pointers in the SMB rally. Extra Rice, Inc. — Beau Belga and JR Quiñahan - paired up to score 38 points for ROS, which squandered a 68-46 lead they held late in the first half. Jericho Cruz also did well with 16 points, while Chris Tiu tossed in a dozen markers off the bench. June Mar Fajardo (SMB) - 36pts, 18rebs, 3asts, 1stl, 5blks, 13/22 FGs. JR Quiñahan (ROS) - 19pts, 11rebs, 3asts, 4stls, 8/13 FGs, 2 triples.